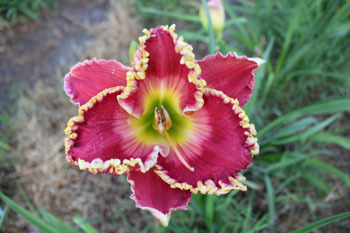 Daylily Blog on Teeth Hybridizing | Hybridizing daylilies is fun! 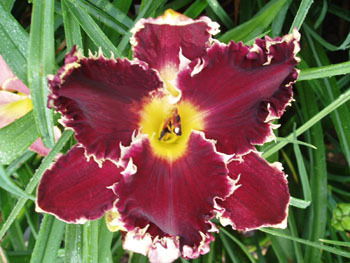 Prior to Bass Gibson’s release , John Rice offered the daylily with naming rights at a MWS. 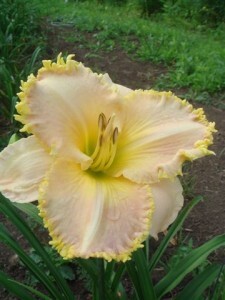 The daylily sold for $700.00 plus dollars to Donna Gibson. 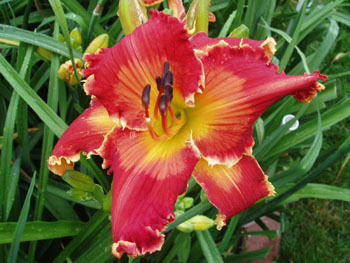 Donna named the daylily after her husband Bass. As fortune would have it Donna is a friend of mine and I was able acquire Bass Gibson the following year of introduction from Donna. John Rice was already sold out. I’ve often talked to John about Bass Gibson. John has made thousands of crosses and produced some beauties. And I don’t know of a garden where a serious teeth hybridizer hasn’t used Bass Gibson. Larry Grace and Jeff Salter have some of the most striking yet to be released Bass Gibson kids that I’ve seen. 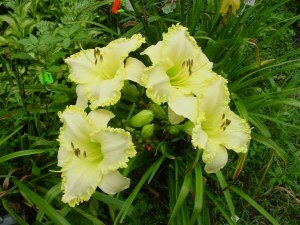 To my knowledge John has released three Daylilies out of Bass Gibson. Pins and Needles, Ruckus, and Shattered Glass. I’d rate Bass Gibson as “Strong” in worthiness to still use today as a parent. Patterned Teeth are coming. It all starts with a tooth. 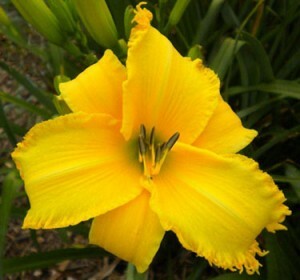 Last summer the daylily tooth fairy rewarded us with a new beginning! Thanks to everyone for their support and best wishes in continuing the blog. 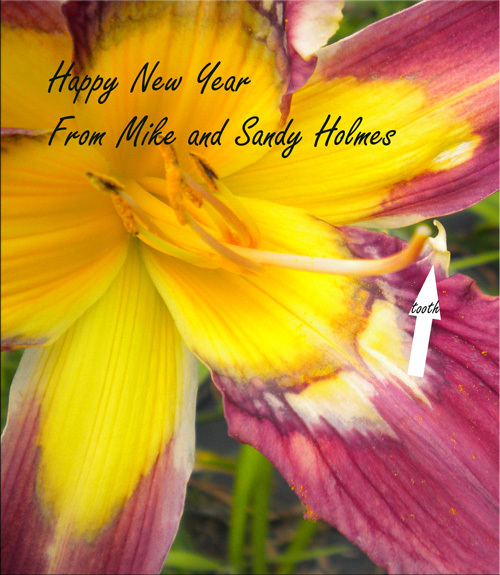 Mike and Sandy Holmes on the daylily teeth blog. P.S. 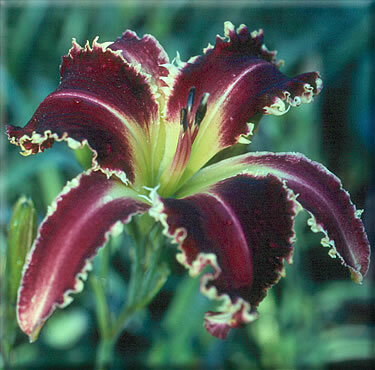 we will finish up the top 2003-2008 teeth daylily soon. 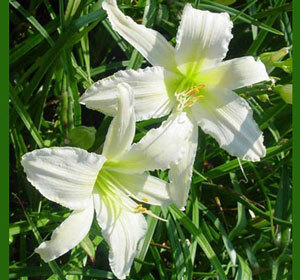 Every year as introductions are made available by hybridizers, hybridizers get together and discuss the new intros. JohnB, JamieG, LarryG,and myself(or some combination) are no different. We have been having pow-wows discussing the must have daylilies annually. I first heard that EIGHT MILES HIGH had been introduced from John Benz. John had just seen the EIGHT MILES HIGH on Luddy’s website. 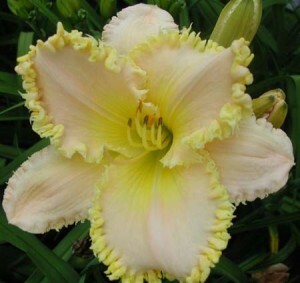 The daylily is registered as a 2003 tet 7.5″ Ev M Re 30″ (Way Cool x [Sdlg x Way Cool]). Now that EIGHT MILES HIGH has been around for some time, the experience of others from the South to the North varies. For Northerners, EIGHT MILES HIGH teeth seem to be heat dependant. 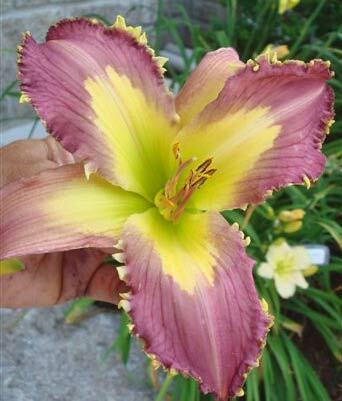 That is not a quality that I usually like but when you are hybridizing with a daylily whose traits such as the purple color, you go with it. 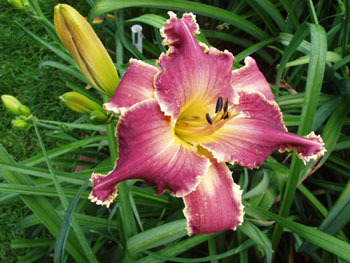 John’s REAP THE WHILRLWIND reaches the top nine daylilies from 2003 to 2008. 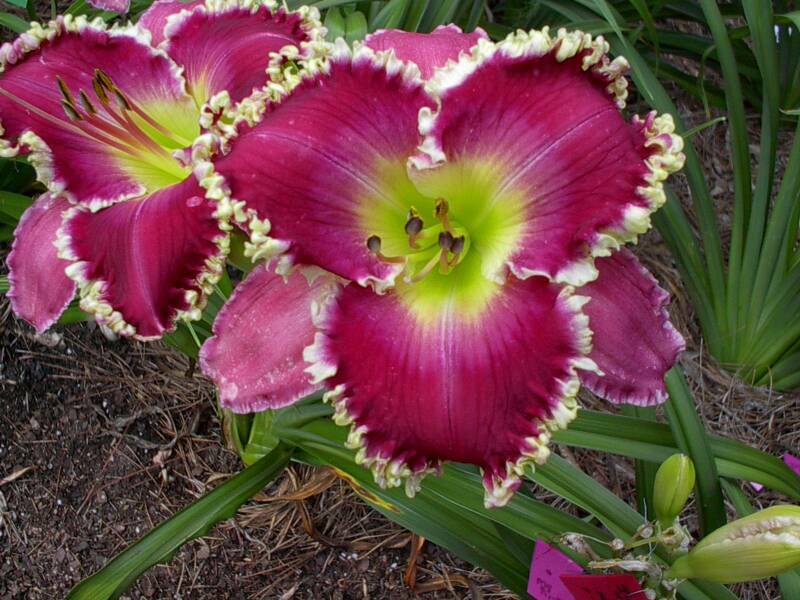 The daylily specs out at t 28″, 7″, M. Dor. with heavy fringy teeth edge. While the scape is shorter and not as well branched as John’s other (Forestlake Ragamuffin X Tet. 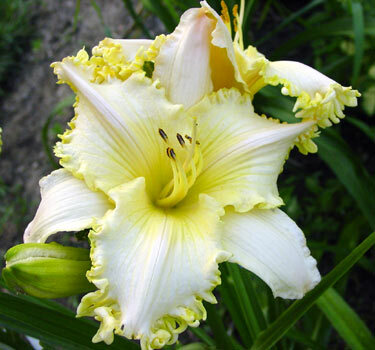 Spindazzle) introductions, the clear yellow color makes it a great choice for a first generation breeder for clear colors. What I mean by this is that there isn’t any dirty bronze or ruddy red color to clean up as in many Spindazzle crosses. So you could use it back with the less clear colors and you have a greater chance of better color the first generation. 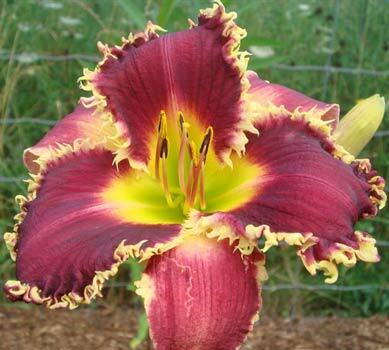 Or if you crossed REAP THE WHIRLWIND to an already clean daylily such as the newly introduced DOCTOR STUMP of Larry Graces, you hit a few home runs first generation. 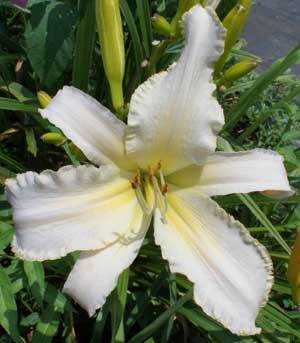 John was kind enough to share pollen with Jamie and myself early on and we both bloomed introductions. Sandy Introduced GOLDEN GLITZ last year and Jamie introduced the phenomenal OUTER LIMITS both from REAP THE WHIRLWIND . Thanks John, nice work! Thanks to everyone who commented to the post on ALAN LANE AGIN. 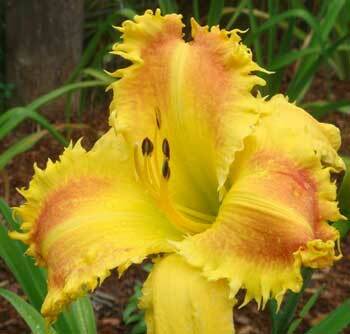 A couple of questions that were asked are, What does it take to produce daylily teeth other than gold? What about Red Friday? What was the cross of the seedling I showed before the ALAN LANE AGIN post? I didn’t mention Red Friday a Top Nine 2003-2008 because when it bloomed in my garden it didn’t look like the images Linda had shown. There were virtually no teeth and the color was not clear. So I didn’t use it. 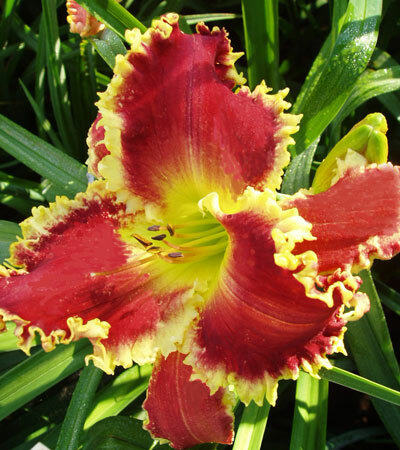 I held the daylily for several years before finally removing it from my display area. Now if I would have listened to Linda, I would have bloomed kids out of it by now . Thanks to several friends, I received images of their RED FRIDAY seedlings. I’m sure they are thrilled they used RED FRIDAY. I about spilled my coffee when I saw David Hansen’s image of HAPPY HOLIDAYS TO YOU x RED FRIDAY. Wow! 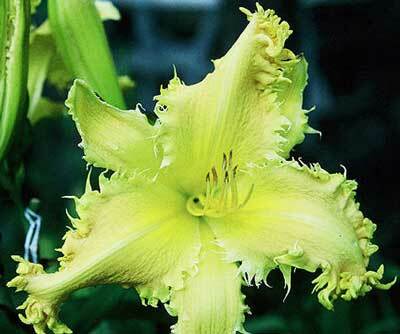 Here David beat me with my own daylily, HAPPY HOLIDAYS TO YOU. Nice job ! 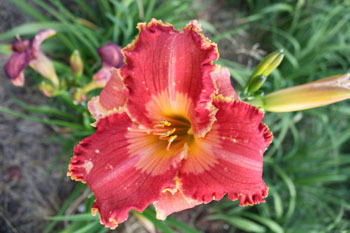 Your daylily seedling ranks among the top Cardinal Red teeth daylily’s that I’ve ever seen. 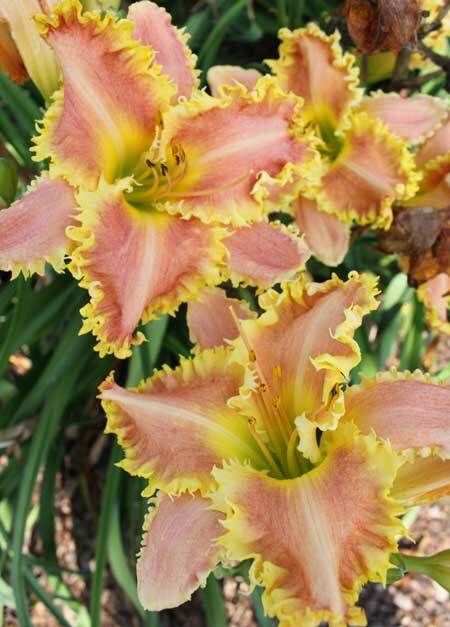 A couple of points made by friends about the Agin daylilies. Bred Red Friday to good color and you will get good color. Red Friday and Alan Lane Agin are both hardy in the North. Alan Lane Agin is sunfast in the South. Rich I’m going to save you question till after the first of the year on how to produce teeth in different colors. The cross of the seedling in two posts previous is LOVE ALL SERVE ALL x OUTER LIMITS. I’ll show other Alan Lane Agin kids and Red Friday kids in future posts. 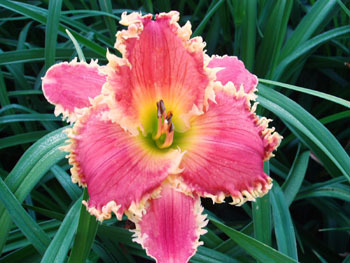 A question that often comes up is, “What teeth daylily has made the most hybridizing impact in recent history?” To qualify for my evaluation, the daylily has to be a 2003 to a 2008 introduction and has had to been viewed as “nice” in my garden. Finalist daylilies include, ALAN LANE AGIN, REAP THE WHIRL WIND, SEE ME FEEL ME TOUCH ME, EIGHT MILES HIGH, WILD HAIR, BASS GIBSON, RANDY STEPHENS, MALCOLM BROOKER SR. and VENUS FLY TRAP. 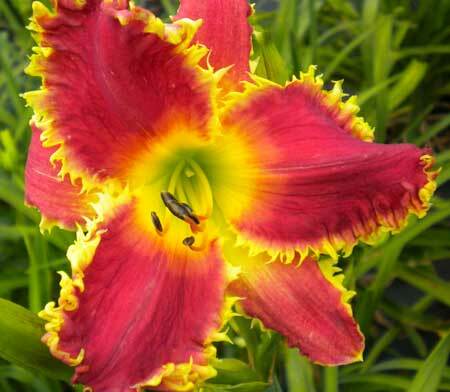 I grow each of these daylilies so I have first hand knowledge of plant habit in zone 5. 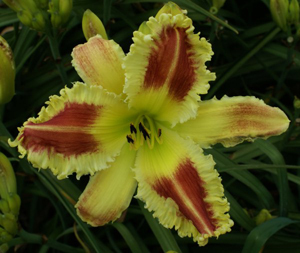 Since we’ve discussed each of these daylilies in previous articles, I’ll focus more on their hybridizing virtues as opposed to the genetics. 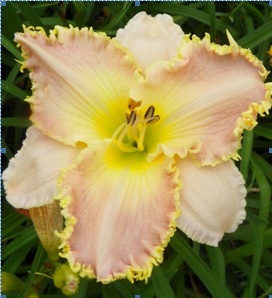 And then I’ll let you know the winner by mid-January….. ALAN LANE AGIN up first of the next daylily teeth blog….